Many people have asked what it is that I actually buy from Vitacost since I posted about my new meal planning efforts with 100 Days of Real Food and Cook Smarts meal plans. 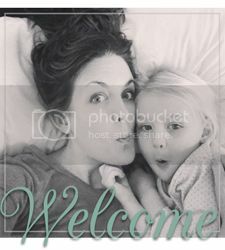 I am still learning about the items that will work best for my family, but so far I'm off to a great start! For those people who have an Earth Fare or Whole Foods down the street you may not need an online place to purchase these types of items. For people like me those stores aren't close, they are very overpriced, and/or they don't have what you want in one store. Vitacost may be the answer if this sounds familiar. Some of these things can randomly be found at Kroger or on Amazon. I price compare every Vitacost item with Amazon because I like to take advantage of my Amazon Prime account when possible. Vitacost has always been cheaper than Amazon. Typically, Vitacost runs a decent amount cheaper than grocery stores (assuming you meet the $49 minimum to get free shipping). Below is the rundown of what I have bought so far based on the type of product. This Vitacost post will be the start of a runnings series of reviews as I find and purchase items. 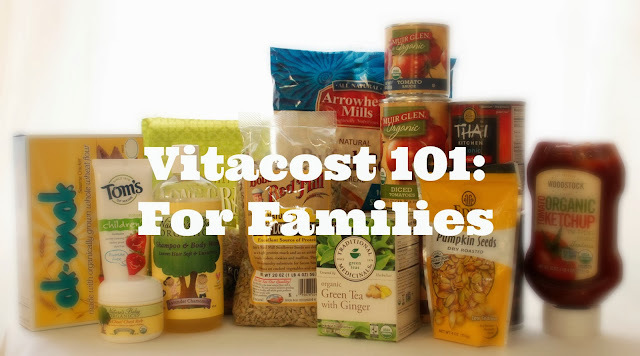 Please leave a comment if you shop on Vitacost and what you buy and love! I'm making an attempt to not live off of caffeine so heavily. My solution is green tea! I purchased both of these items per the grocery list from 100 Days of Real Food's meal plans. They are both basic, but good. They both have minimal number of ingredients which is what I'm aiming for along with organic ingredients. I use these ingredients (and others like the rolled oats below) to make these. Lila calls them "balls that you eat". There are a million ways that I use rolled oats and rice! My favorite recipe with oats is this one. And my current favorite recipe with rice is this one. I love these! Throw them in a trail mix or eat them solo. So yummy. I've purchased multiple organic canned food items on Vitacost. They are cheaper than buying them at the store, but you do typically have to buy more than one. All of the items below are great for all sorts of things. We make mini pizzas once a week, so I buy a lot of pizza sauce. I also love to make this chili. Lastly, one of Seth's favorite dinners is Thai Coconut Shrimp Soup. The recipe I used was pulled from a magazine, so I don't have a link, but if you're interested in having it let me know! For a while I was making my own countertop spray. Seth hated the smell of it (vinegar based) so I finally decided to try something different. This spray is awesome. It smells wonderful, a little goes a long way, and it's a brand I trust. Sold! Vitacost also carries the 32 oz refill. I love California Baby (CB) products. My girls have sensitive skin and I swear by their products. However, I am constantly on the hunt for similar alternatives because California Baby is outrageously priced. In comparing ingredients I use the website Skin Deep. The products below that I have purchased and used have almost the same rating as the California Baby products. In my mind if the product is "in the green" as far as their rating system goes I'm comfortable with it. This bug spray is excellent if you are looking for a safe option for your kids. It has a strong smell, but what bug spray doesn't? It works well and isn't as sticky as some other natural bug sprays. With cold and flu season upon us I decided to buy this even though no one was sick when I purchased it. It's a safe alternative to Vick's Vapo Rub. Those sleepless nights when your child has a terrible cough are brutal, and this stuff really seems to help! This shampoo and body wash is a great alternative to CB. The smell isn't as amazing, but nothing will beat the smell of CB products for me. It's a great, gentle wash with a fresh scent. This is our go to toothpaste for kids. It doesn't have the crazy taste that brands like Crest have which makes my girls more agreeable to brushing in general. It is cheaper here than I have found it anywhere else. These were my first attempt at using a more natural shampoo and conditioner. I do color my hair because the grey is taking over! I know that isn't a very natural thing to do, but sometimes concessions have to be made. I do not love this product. It has a great rating on Skin Deep and got good reviews on Vitacost. I found it left my hair flat, dull, and lifeless. This product is very watery which means a lot comes out at once. It creates minimal bubbles, and the kids always want you to put more in. We haven't had it long and it's almost gone. I would love suggestions for a good, natural bubble bath alternative for kids. That's it for my gigantic first Vitacost post. Again, please contact me if you would like a referral to earn $10 towards your first purchase. I would love to try Vitacost, can you send me a referral! Also, can I ask why you don't want your girls to use a fluoride toothpaste? Just sent your referral! So, I hate to admit this, but Lila still struggles with the spitting part of brushing and not swallowing. I think it's an issue of being in a hurry sometimes. And Evie is just starting to learn the spitting part too! Currently they both still swallow most of the toothpaste. That's why I haven't fully switched to fluoride toothpaste. Any tips? Try using less toothpaste. Really just a smear to pea size amount is all you need. The mechanical motion of brushing actually does more than the toothpaste for cleaning teeth. The less foam is in their mouths, the less likely they are to want to swallow (they also will usually brush longer). Swallowing a small amount occasionally is fine, but if they are swallowing all of it on a regular basis, stick with the fluoride free. You may want to make sure they are getting fluoride from somewhere though, like tap water, or fluoridated bottled water or juice. Hey Melissa! Thanks for stopping by. Soooo…have you already registered with Vitacost? Do you have an account? I'm asking because I thought when someone referred to me that it simply went towards my first purchase. The thing is, they won't give you the referral "gift" unless you are brand new to the site. You said you have a cart full so that's why I'm asking. If you haven't signed in with your email yet then it should still work. Or, if you have another email you could use that hasn't been registered with the site that works too. Feel free to email me at janabateman@gmail.com with the email address you would like for me to refer to. Thanks so much! This is great post! I never even knew about vitacost.